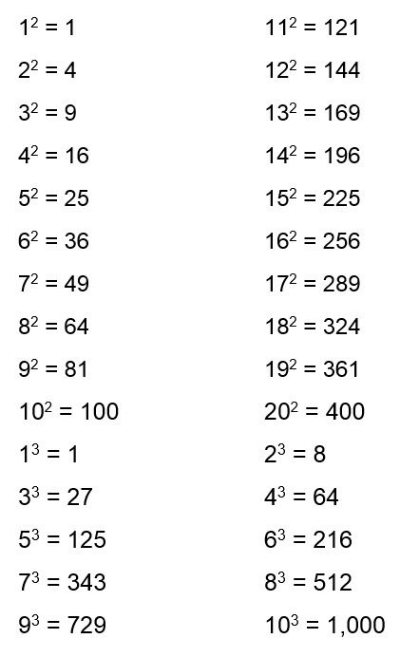 You find here a quick reference to those algebraic formulas that just escape you, those symbols that need explanation, and some guidelines for deciding if a number can be divided evenly. The rules for operating on exponents are all here, in one handy place, and some quick factoring hints are provided. As you refer to the items in this Cheat Sheet, looking for some help, you may also stumble onto something you never knew you needed. Go for it! Some formulas, those worth memorizing, occur frequently when you’re doing algebraic manipulations and working through mathematical applications. You’ll find ways to use these formulas even when you’re doing something other than algebra, such as planning a garden or road trip. Of course, you need to know what the letters and symbols in the formula mean, so the list here shows both the formulas and the explanations. The distance traveled, d, equals the rate, r, multiplied by the time, t.
Simple interest earned, I, equals the principal, P, times the interest rate in years, r (as a decimal), times the time, t (in years). The amount, A, resulting from compounding interest equals the principal, P, times the sum of 1 and the quotient of the rate of interest, r, divided by the number of times compounded each year, t, all raised to the product of the number of times compounded, n, times the term (number of years), t.
The temperature in degrees Fahrenheit, F, equals 9/5 time the degrees Celsius, C, plus 32. The Pythagorean Theorem shows the relationship between the sides of a right triangle. The longest side, measuring c, is always opposite the right angle. The sides measuring a and b are the other two sides. The solutions of a quadratic equation, ax2 + bx + c = 0, are found by substituting the values of a, b, and c into the formula. When factoring algebraic expressions so you can solve equations, you need to understand the rules of divisibility to be able to pull out the greatest factor. 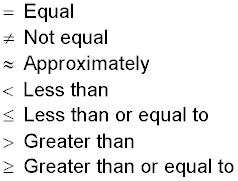 Also, common factors are needed when reducing algebraic fractions. The rules of divisibility help you to find the common factors and change the algebraic expressions so that they’re put in a more workable form. Divisibility by 2: A number is divisible by 2 if the last digit in the number is 0, 2, 4, 6, or 8. Divisibility by 3: A number is divisible by 3 if the sum of the digits in the number is divisible by 3. Divisibility by 4: A number is divisible by 4 if the last two digits in the number form a number divisible by 4. Divisibility by 5: A number is divisible by 5 if the last digit is 0 or 5. Divisibility by 6: A number is divisible by 6 if it is divisible by both 2 and 3. Divisibility by 8: A number is divisible by 8 if the last three digits form a number divisible by 8. Divisibility by 9: A number is divisible by 9 if the sum of the digits of the number is divisible by 9. Divisibility by 10: A number is divisible by 10 if it ends in 0. Divisibility by 11: A number is divisible by 11 if the sums of the alternate digits are different by 0, 11, 22, or 33, or any two-digit multiple of 11. In other words, say you have a six-digit number: Add up the first, third, and fifth digits — the odd ones. Then add the digits in the even places — second, fourth, and sixth. Then subtract the smaller of those totals from the larger total, and if the answer is a multiple of 11, the original number is divisible by 11. Divisibility by 12: A number is divisible by 12 if the last two digits form a number divisible by 4 and if the sum of the digits is divisible by 3. The relationships in algebra indicate that two values are exactly the same, one value is larger or smaller than another, or that two values are close to being the same. The symbols represent these different relationships. If an operation appears more than once in an expression, perform that operation from left to right. When graphing points on the coordinate axes, you can determine distances and slants of segments determined by the points. The coordinates of the points are: (x1, y1), and (x2, y2). When working with terms that have the same base, you perform multiplication, division, and raising to powers by working with the exponents. 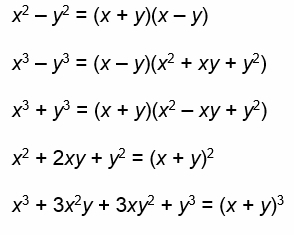 In all cases shown here, x does not equal 0. Knowing which numbers are perfect squares or perfect cubes is most important when doing factoring of expressions and solving practical applications in algebra. The following list shows perfect squares and perfect cubes.